If the spot is lighter in color this is not a good sign as it may indicate that there is a color loss instead of just a spot. If this is the case, a professional company that is thoroughly familiar with spot dyeing carpet is a must. A spot is any foreign substance that adds texture to a fiber. A stain is anything that adds to or deletes the color of a fiber. 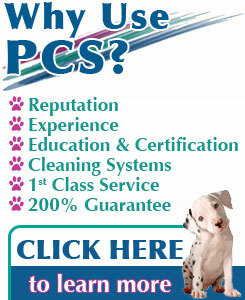 Obviously, stains are not easily removed and usually permanent, whereas spots are more readily cleaned up. blot up as much as possible with an absorbent paper or cotton towel. if the spill is thick, use a spoon to remove as much as possible by scraping toward the center and scooping up. then start the blotting process. repeat this procedure until no more residue from the spill transfers to the towel. repeat the blotting sequence until no more residue transfers to the toweling. For oil based spots like greasy foods, grease, oil, tar, butter, use a dry cleaning solvent such as Energine or Carbona. These can be purchased at most large grocery stores. if discoloration occurs, do not use. this reduces the chance of any residue resurfacing later. Putting a fan on the area can also help.